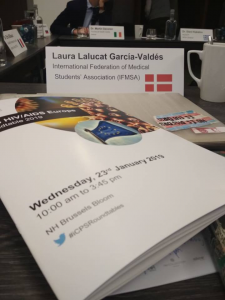 Comprehensive Sexual Education, discrimination as a barrier to access to healthcare, Universal Healthcare Coverage and meaningful youth participation were some of the topics IFMSA could share our stances last Wednesday in the HIV/AIDS Europe Roundtable 2019 that took place in Brussels, organized by the International Centre for Parliamentary Studies. 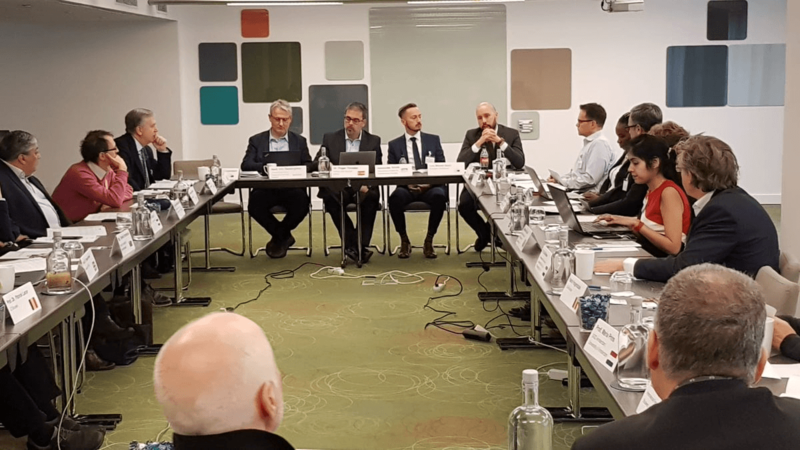 The Roundtable gathered around 25 participants with different backgrounds as NGOs representatives, policy advisors, doctors and researchers, national public health agencies and government representatives from all around Europe. Through open discussions around diverse topics related to policy guidelines and strategies for the HIV response, by the end of the day, the Roundtable was closed by proposing a list of recommendations for policy makers, governments and key stakeholders to support an EU-wide strategy towards the HIV and AIDS response. The discussions covered important multidimensional aspects as how to improve the testing, diagnosis, and treatment on HIV and AIDS – self-testing and eHealth were at the center of the discussion. Migrants’ health and the existent cross-cuttings between different key populations and the problem of how to tackle their needs were also passionately debated, in addition with their inclusion in policy making and Antimicrobial Resistance among others. It was a great opportunity to get an update of the current barriers existing in Europe when it comes to walk towards the goal of ending AIDS by 2030. IFMSA could gather multiple resources and ideas to put in practice through our advocacy and campaigning efforts and our input was incorporated into what will be the final call to action to Member States. We’re looking forward to seeing the outcomes published and that the recommendations turn into real change. Do you want to know more about the topic?